National Insurance Parivar Mediclaim Policy is a health insurance policy for family. It is a Family Floater policy that covers entire family consisting of self, spouse and two dependent children under single sum insured. National Insurance Parivar Mediclaim Policy covers hospitalization expenses incurred for treatment of illness or diseases or injury sustained by the insured person during the policy period. 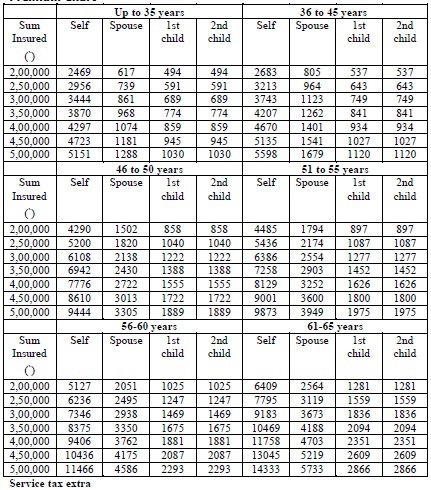 National Insurance Parivar Mediclaim Policy is available to the persons between age group of 18 and 60 years. Tax benefit under section 80 D of the Income Tax Act for premiums paid. For more information regarding Income Tax Benefits, visit www.taxqueries.in. Portability facility is available to switch to National Insurance Parivar Mediclaim Policy, on renewal, without losing any accrued benefits. In-patient treatment – 1% of sum insured per day for normal room & 2% of sum insured per day ICU. Expenses incurred for Any One Illness – 50% of sum insured. Diabetes and Hypertension are covered by paying extra premium. 2 (two) years waiting period for following diseases. Joint replacement of any kind (unless arising out of accident). Deviated nasal septum and related problems. HIV/AIDS, Non allopathic treatment, Maternity, Vitamins, tonics, wars etc. To buy National Insurance Parivar Mediclaim Policy you need to fill the proposal form with complete and accurate information and you have to submit to the National Insurance Office. You can also buy National Insurance Parivar Mediclaim Policy through online. National Insurance Parivar Mediclaim policy Claim Form is to submitted to the National Insurance company or TPA during claim settlement. It is to be filled completely and accurately. You can calculate the premium using National Insurance Parivar Mediclaim Premium calculator. Personal details, Number of members, Policy period, Age and Sum assured and other details are required to calculate the premium. How much extra premium is to be paid if any member of the family is suffering from hypertension or/and diabetes? For Hypertension or Diabetes – 10% extra premium is charged on the total premium. For Hypertension and Diabetes – 25% extra premium is charged on the total premium. Give me some information about loading on the premium? In case, National Insurance Parivar Mediclaim Policy is extended beyond 60 years – 25% loading for 56 to 60 years band is to be charged. At what situation National Insurance Parivar Mediclaim Policy will get cancelled? What is meant by TPA? TPA (Third Party Administrator) means any entity, licensed under the IRDA, and is engaged by the company for a fee, for providing health services. What is meant by Any One Illness? Any one illness means a continuous period of illness which includes relapse within 45 days from the last consultation date with the hospital where treatment has been taken. seen , good policy. Premium rates are not shown .Kindly send the same. hOW MANY TIMES CAN A FAMILY AVAIL THE FACILITY IN ANNUM? I have three children. The elder son is 17 years old. Twin daughters are 12 years old. I am 48 years old and my wife is 43 years old. How do I get a National Insurance mediclaim policy for all five of us. I would also like to include my parents father-74 and mother (73). Whether national insurance cover maternity ? I had a existing parivar mediclaim for my family..I want to know upto which age I can renew the policy?